The Fourth Red Star represents the century of progress, and was added for the Exposition of 1933 (added in 1933). The "Fort Dearborn" star was the last added to the flag in 1938, however when this was done, it was placed in chronological order so it is the star closest to the hoist. In my ongoing research, I discovered that the original ordinance designated the star as representing "The Fort Dearborn Massacre." But as there seem to be questions about the accuracy and interpretation of the accounts of that incident, the current information from the City of Chicago simply states that the star represents the fort itself. "Its uppermost stripe, of white, is eight inches broad; the second stripe, of blue, is nine inches; the central bar, of white, is eighteen inches, and the two lower stripes correspond with the uppermost two. Near the staff on the broad white stripe are two six pointed red stars, fourteen inches tall." "Viewed locally, the two blue stripes symbolize the Chicago river with its two branches and the three white bars represent the three sides of the city. The red stars stand for the Chicago fire and the World's fair, two great influences on the city's history. The six points in the first star stand for transportation, trade, finance, industry, populousness, and healthfulness; those in the second for religion, education, aesthetics, beneficence, justice and civism [sic]." "Considered nationally, the blue stripes stand for the mountain ranges which flank the plain of which Chicago is the center. The central white bar stands for this plain and the two outer white bars for the Atlantic and Pacific coasts." The flag was designed by Wallace Rice, 2701 Best avenue." The Chicago flag of 1917-1939 had sharper pointed stars. While no special significance was then attributed to their points, Rice explained that the stars were given six points to avoid confusion with the five-pointed stars on the national flag. Possibly to reinforce this distinction, the first stars had long and rather sharp points; their form persisted for several decades. The original 2-star flag is illustrated on The Great Chicago Fire and Web of Memory page at www.chicagohs.org/fire/commemorate/pic0132.html. 1017. The Chicago municipal flag. The Chicago municipal flag shall be white, with two blue bars, each taking up a sixth of its space, and set a little less than one-sixth of the way from the top and bottom of the flag, respectively. There shall be two bright red stars with sharp points, six in number, set side by side, close together, next the staff in the middle third of the surface of the flag. 1023 of the same code mentions the flag can have the ratios of 2x3 or 3x5. 1018. The municipal standard. The municipal standard shall be made of silk and fringed with gold composed of the same colors, hues and parts as provided for in section 1017. 1019. The municipal pennant. The municipal pennant shall be a long streamer showing the two stars on white at the staff, the fly being equally divided, blue and white. For the pennant, the ratios stated in 1023 of the code is either 2x15 or 2x20. There is no mention about the shape of the pennant other than a streamer. The "a little less then one-sixth", I've taken as 1/6th again of the width of the bars. The stars I've drawn at the full 1/3rd of the flag's height. This slightly smaller off-set of the bars serves to separate the stars from the bars, and that same margin I used at at the other sides of the stars, though only once between them as they are close together. The sharp points I assumed to refer to the stars being lean. For the blue I used general blue, as there's no indication of a lighter shade at that time. Used until 1933 when the third star was added to recall the World's Fair in 1933. This flag got 9.03/10 points in the NAVA American City Flag Survey ranking 2nd among 150. The flag image shown in Kaye (2004) differs in detail from the one at the top of this page: the stars are much larger and the stripes are sized and placed differently: (28+38+84+38+28):324 in vs. ~(2+2+6+2+2):21. All other details - color shades (B- and R+), and shape and position of the stars (thin and upright) - are identical. I found full-frame photos of the Department's flag. The graphic is made according to the design elements visible in several photographs. This flag is being used by the City of Chicago, Bureau of Tourism, to welcome visitors to Chicago, especially for the year 2000 celebration. The mayor of this city, Richard M. Daley, has invited regular everyday people from all over the world to dinner New Year's Eve in Chicago. We have what we think is a flag from the 1893 World's Fair. 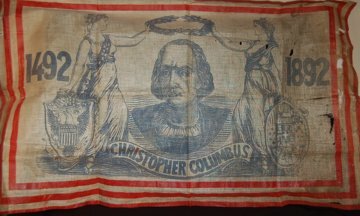 It shows Christopher Columbus and the dates 1492-1892. It was purchased by my friend's father in 1906 or 1907, in New York, for $1.50. They had a few more things that they said were from the Columbian Exposition but most of those have been sold. We assume this was also from the Columbian Expo in Chicago. Postcards at Ebay, showing the Chicago world fair of 1933-34 Avenue of Flags. Together they apparently show the avenue in both directions, with all of it lined with, you guessed it: Flags. They appear to be cut to hang straight from an angled staff, and it may be they also taper, but I'm not sure. These three show a photograph towards the North, where Stars and Stripes fly at the North Entrance, with outside the Fair the Shedd Aquarium, opened a few years earlier: one, two, three. The flags are red with a yellow stripe along the "bottom". This one shows a photograph towards the South. This was the view from the gates: An avenue filled with flags, leading to the Hall of Science: Here the flags are similar, but have a black separator line. I can't decide whether those were in the photograph or not. The first three just mention 1933, but only as the centennial of 1833, the last also mentions just 1933 but has a 21 August 1934 stamp. Another (no longer available) shows the avenue towards the North again. Here the flags are all red, slightly on the purplish side. This postcard explicitly says it shows Chicago's 1934 International Exposition. That would suggest that the flags differed between the years: 1933 with yellow stripe, 1934 without and maybe a bit more purplish. At www.gettyimages.com/detail/83956350, we can see the Chicago 2016 Olympic bid flag, hoisted along with national, state, and city flags. It is a plain white flag (~3:5) with the bid campaign logo on it. The Chicago Cubs winning the baseball World Series brings their interesting flag custom to light. A flag with a blue W on a white field is flown from Wrigley Field to signify a Win by the team, while an L flag signifies a loss. Chicago Cubs fans are flying their W flags all over the world. A Google search will bring up lots of pictures. While the flag itself is Not Of Vexillological Interest, I find it interesting that there's no way to connect the flag to the team unless you know the Wrigley Field tradition - a very odd thing for a sports team-related flag. The only other sports team flag that comes close to that (that I know of) is Michigan State University, which uses a white S on a green field. The S is for either State or Spartans, but either way, without having all 3 letters: MSU, it's less obvious than most. But W for Chicago? You really had to be an insider to know that one, until now!